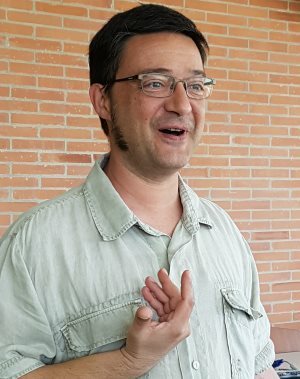 Though the rise and rise of Prosecco over the last decade must have impacted on other sparkling wines, including Spanish favourite, Cava, there are some producers that exude a quiet confidence that the sheer quality of their product will guarantee success whatever the competition. The family-owned, medium-sized company of Juve & Camps undoubtedly fits the bill, and it was a pleasure to spend a couple of days with them recently to learn their story and taste their hugely impressive wines. At the helm of the company is the youthful, gentle, but cool and confident Meritxell Juve. 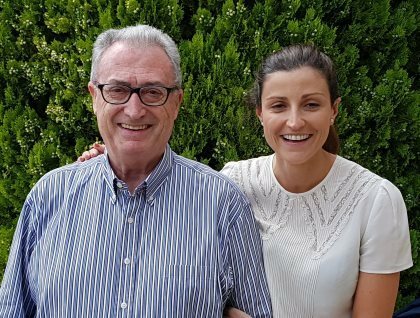 At 32 years old, Meritxell may have inherited a huge responsibility as CEO of a company which produces 2.5 million bottles of premium Cava per year and services world-wide markets, but by her side for a couple of days per week at least is Company President, 75-year-old Joan Juve, otherwise known as ‘dad’. Arriving at the winery we are joined by winemaker Toni Cantos, left, a man with huge enthusiasm for his job as he gives up a day of his annual holiday to lead us through the wines. Toni explains that Juve & Camps is not a négociant – they never buy base wine, though sometimes they buy grapes, depending on the harvest. The base wines for all of their Cava is made here at their new high tech winery in Espiells, five kilometres from Sant Sadurni d’Anoia and surrounded by their vineyards. The base wine is then transferred to the old family cellars, where six levels of subterranean tunnels offer the perfect environment for the second fermentation and ageing. Their still wines are also made at Espiells. 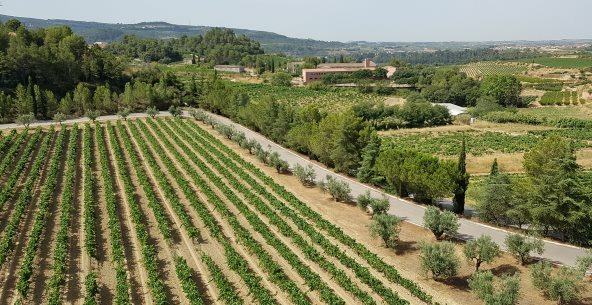 Below: the vineyards at Espiells. As we move through to the tasting room, Toni explains that all grapes are hand-picked, which means there can be a first quality selection done in the field, and his priority is to protect the fruit from oxidation. Though the traditional Cava grapes of Xarel.lo, Paralleda and Macabeu are grown, Pinot Noir and Chardonnay are their main varieties planted in their own vineyards, “Because it is hard to find those outside of our own holdings,” says Toni, adding, “But Xarel.lo is a very good wine for ageing, and the most interesting of the three Cava grapes.” They are relying less and less on Paralleda and have “little bits and pieces of lots of other varieties,” including Muscat, Syrah and Cabernet Sauvignon, mostly for still wines. All of Juve & Camps vineyards were converted to organic farming four years ago, and certified in 2015. But at the moment the family has taken the decision not to label any wine as organic, but instead will wait until their iconic Family Reserve bottling, made from organic grapes, is ready for the market after its long bottle ageing. “We don’t want to confuse the market by having some of our labels organic, and some not,” says Meritxell. Juve & Camps struck me as an extremely quality conscious house, not just with their vineyard ownership and commitment to organic farming, but with their fascinating range of Cavas, including an extremely good Brut Rosé, where Toni has reduced the lees ageing from 24 to 12 months to retain freshness, a zero dosage ‘Brut Nature’ and their extraordinary La Capella, another zero dosage, 100% Xarel.lo wine, that spends 10 years on the lees. We tasted the current 2006 release. Meritxell is such an assured, capable yet warm and welcoming character. She is following in her father’s footsteps it’s true, but she is clearly regarded with huge affection and respect by all of the Juve & Camps team that I met. 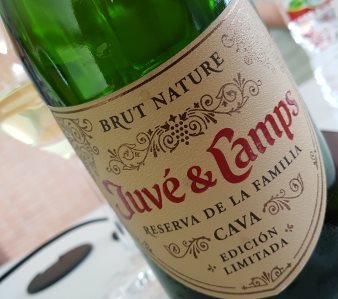 This truly interesting Cava house should stride forward confidently, no matter what Prosecco throws at it. Juve & Camps is imported into the UK by Ehrmanns. (2018) Made from the three traditional Cava grapes, with around 8g/l sugar dosage. This spends 24 months ageing on the lees, and is Juve y Camps' entry level wine. It has a lovely, deep citrus nose, with a certain weight and pulpy, stone fruit fleshiness, then a clear and precise palate that is crisp though retains that fruitiness and light silkiness of texture. Very fine. (2018) A lowly 6g/l dosage for this Blanc de Noirs made from 100% Pinot Noir - which, under Cava regulations, was not allowed until very recently. Aged at least 36 months it has a fairly deep colour with a glint of copper, with a lovely complex nose, certainly some autolysis here, lots of creaminess and a touch of biscuit. The palate has a hint of waxiness and herbs, lime skins and plenty of complexity, hinting at herbs but lemony fresh. (2018) Made from 100% Xarel.lo and aged 24 months on lees. Waxy, almost Riesling-like character, fennel and sesame seeds, very Cava. Beautifully made, lots of flavour and tangy freshness. No UK stockist listed at time of review; stockist quoted ships from Spain. 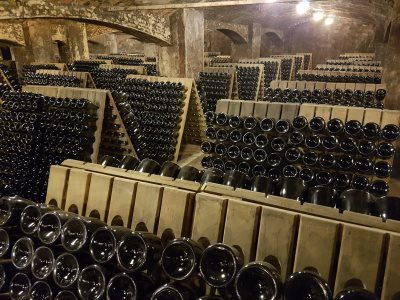 (2018) A selection of the base wines that Toni thinks have the greatest capacity to age. 42 months in bottle for this wine, made from the three Cava grapes plus 25% Chardonnay, and only 6g/l dosage. Deep and nettly, bready aromas, with a wonderful development giving nuttiness and toast in the mouth, a broad sense of richness, the finish complex and layered. Stockist and price quoted at time of review are for the 2011 vintage. (2018) One of my favourites of the range, but sadly it doesn't seem to be available retail in the UK at time of writing. 100% Chardonnay with 7g/l dosage, but higher acid makes it feel noticeably drier than the rosé. Really lovely nose, almondy, mealy and rich, with a creaminess and tang of citrus and a bit of melon-rind grip. I also tasted the 2008 with lunch which was wonderfully rich and toasty, having developed beautifully in bottle as I suspect this will too. Finishes with lovely freshness and length. (2018) What an extraordinary wine: 10 years of ageing, 100% Xarel.lo, again a selection of the best base wines, but from a single vineyard. This also has zero dosage. There is a hint of bruised fruit on the nose, and carrying through to the palate, hints of seeds and nuts, with honey and lovely toasty character, then the palate freshening up really nicely, long, very fine, the complexity of the aged Xarel.lo overtaken by a cool, clear, fruit and acid finish. This wine has potential to be part of the new classification for single vineyard wines, introduced last year by the Consejo.